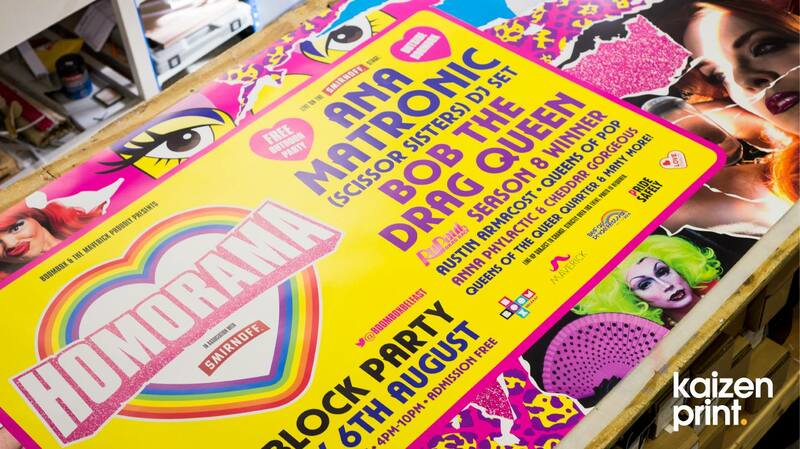 Belfast Pride takes place this weekend and all throughout the week we’ve been printing flyers, posters, pvc banners and foamex signage for the organisers of the events taking place all around the city today. Focusing on equality and diversity Belfast Pride is one of the biggest festivals, Ireland’s largest lesbian, gay, bisexual and transgender festival and ranks in the top ten largest Pride parades in the UK! We’re proud to be apart of the pride day activities and want to wish all those attending the most fabulous of days. Thankfully the weather seems to be holding out and all our print will be shown in the best of lights. If you happen to see any of our work in situ take a little photo with it and tag us over on twitter or facebook. We’d love to see what you guys and girls are getting up to. Below is a huge poster printed for Boombox bar and frankly it’s one of the most colourful prints we’ve completed in the longest time and we love it. Unfortunately their outdoor block party on Donegall Street has been given the no go, so their event is being held in their bar / nightclub starting at 2pm today. If you’re looking to find out more about today’s activities head on over to Belfast Live where you can find the most comprehensive pride guide and everything you could possibly need to know about the event. Have a wonderful day everyone.